Over 250 people joined J. Lindsay Brown Dance at Indian Boundary Park’s Nature Play Center (‪2555 W. Estes Avenue) ‪on September 10-11 to visit the "Movement Zoo," a free family friendly, site-specific dance event celebrating local wildlife. Audience members visited the ongoing exhibits from 2:15-4:15pm. Prior to the Nature Play Center’s creation, the area was literally a zoo. In the 1920’s, Frank Kellog, President of the Ridge Avenue Park District, opened the park with the donation of a black bear. The zoo remained open until 2013, after which it was converted into a play area. At “Movement Zoo”, audience members caught glimpses of dancers in their not-so-natural habitats. Viewers wandered the Nature Center during the performance, deciding what they wanted to watch and for how long. Dancers toed the line between human and animal, invoking their own unique creatures inspired by the local wildlife and the park’s rich history. 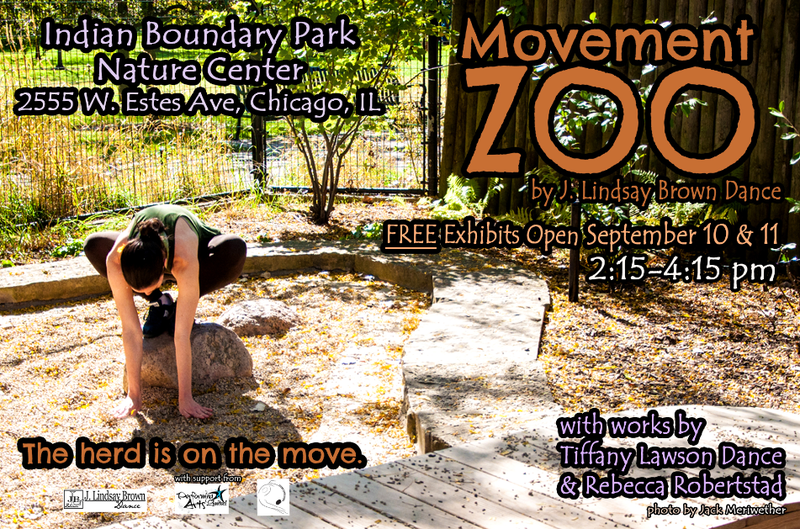 Movement Zoo featured work by J. Lindsay Brown Dance, Tiffany Lawson Dance, and Rebecca Robertstad.